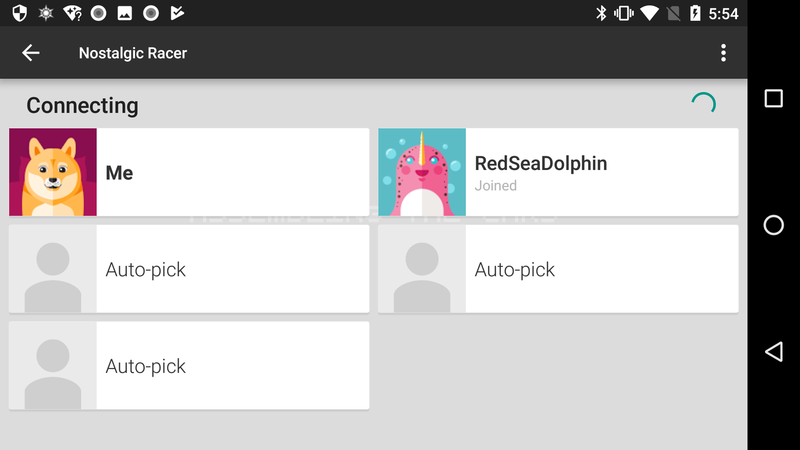 This guide shows you how to implement a real-time multiplayer game using the Google Play games services in an Android application. The APIs can be found in the com.google.android.gms.games.multiplayer, com.google.android.gms.games.multiplayer.realtime, and com.google.android.gms.games packages. 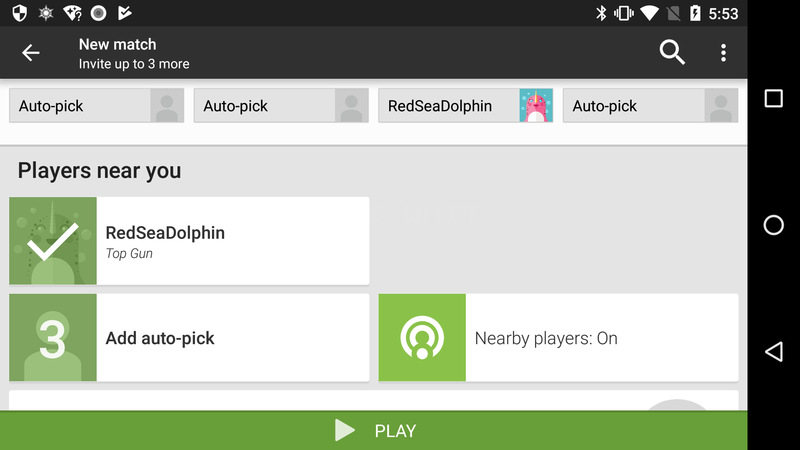 Make sure to enable real-time multiplayer support for your game in the Google Play Console. Download and review the real-time multiplayer game code samples in the Android samples page. To start using the real-time multiplayer API, your game must first obtain a RealTimeMultiplayerClient object. You can do this by calling the Games.getRealTimeMultiplayerClient() method and passing in the activity and the GoogleSignInAccount for the current player. To learn how to retrieve the player account information, see Sign-in in Android Games. Note: The RealTimeMultiplayerClient class makes use of the Google Play services Task class to return results asynchronously. To learn more about using tasks to manage threaded work, see the Tasks API developer guide. Invite Players button - Lets the player invite friends to join a game session or specify some number of random opponents for auto-matching. Show Invitations button - Lets the player see any pending invitations sent by another player. Selecting this option should launch the invitation inbox, as described in Handling invitations. When the player selects the Quick Game option, your game should create a virtual room object to join players, auto-match the player to randomly selected opponents without displaying the player picker UI, and immediately start the game. If your game has multiple player roles (such as farmer, archer, and wizard) and you want to restrict auto-matched games to one player of each role, add an exclusive bitmask to your room configuration. When auto-matching with this option, players will only be considered for a match when the logical AND of their exclusive bit masks is equal to 0. The following example shows how you can implement the quick game option and use the bit mask to perform auto matching with three exclusive player character roles. private static final long ROLE_ANY = 0x0; // can play in any match. // auto-match criteria to invite one random automatch opponent. // You can also specify more opponents (up to 3). // Save the roomConfig so we can use it if we call leave(). When the Invite Players option is selected, your game should launch a player picker UI that prompts the initiating player to select friends to invite to a real-time game session or select a number of random players for auto-matching. Your game should create a virtual room object using the player's criteria, then start the game session, once players are connected to the room. To obtain the user's selection, your game can display the built-in player picker UI provided by Google Play games services or a custom player picker UI. To launch the default player picker UI, call the getSelectOpponentsIntent() method and use the Intent it returns to start a Activity. Your game receives the initiating player's criteria on the onActivityResult() callback. It should then create the room and set up listeners to receive notifications of room status changes or incoming messages. // Get the invitee list. // Create the room configuration. To be notified of errors during room creation, your game can use the RoomUpdateCallback class. If a room creation error occurred, your game should display a message to notify players and return to the main screen. To be notified when all players are connected, your game can use the RoomUpdateCallback.onRoomConnected() method. Your game can also use the RoomStatusUpdateCallback class to monitor the connection status of the participants. Based on the participant connection status, your game can decide whether to start or cancel the gaming session. // are we already playing? // Returns whether the room is in a state where the game should be canceled. // Peer left, see if game should be canceled. // Connected to room, record the room Id. // This usually happens due to a network error, leave the game. // Update status due to  peer to peer connection being disconnected. Note: The player ID is not the same as the participant ID. A player ID is a permanent identifier for a particular user and is consistent from game to game. A participant ID is a temporary identifier that is valid only for a particular room. Some players may have both a player ID and a participant ID. Players who join the room via auto-match will only have a participant ID and not a player ID, to preserve anonymity. Warning: The Room object passed to a callback may not be the same as the object passed to previous callbacks. If your game keeps a reference to the Room object, it should update that reference whenever it receives a callback that includes a Room argument, such as RoomStatusUpdateCallback.onPeersConnected() and RoomStatusUpdateCallback.onPeersDisconnected(). Calling methods on an out-of-date Room object may return stale information or cause other problems. To launch the default waiting room UI, call the RealTimeMultiplayerClient.getWaitingRoomIntent() method and use the intent it returns to start an activity. Your game can launch the waiting room UI from the RoomUpdateCallback.onRoomConnected() and the RoomUpdateCallback.onJoinedRoom() methods. Warning: If your game uses the room's total number of participants (returned by Room.getParticipantIds().size()), be aware that the number of participants may grow as new auto-match participants join the room. For example, if you invite two specific players and two auto-matched participants, the number of participants returned by getParticipantIds().size() starts initially at two but may increase to three or four as participants are auto-matched. Activity.RESULT_OK - All invited players were successfully connected to the room. Activity.RESULT_CANCELED - The player pressed the Back button or the Up button on the Action Bar. GamesActivityResultCodes.RESULT_LEFT_ROOM - The player selected the Leave Room option. // "start game" message is received. In this case, ignore the result. You can implement a different response depending on whether the user explicitly canceled the game (GamesActivityResultCodes.RESULT_LEFT_ROOM) or whether the user quit the waiting room UI (Activity.RESULT_CANCELED). For example, if the player dismisses the UI with the Back button, you can minimize the app and still continue the handshake process in the background. However, if the player chose the Leave Room button from the waiting room UI, you can cancel the handshake. If you use the waiting room UI, you do not need to implement additional logic to decide when the game should be started or canceled. When you obtain an Activity.RESULT_OK result, you can start right away since the required number of participants have been connected. Likewise, when you get an error result from the waiting room UI, you can simply leave the room. When creating the waiting room, your game can specify the minimum number of players required to start the game session. If the number of connected participants is more than or equal to the specified minimum to start the game, the system enables the Start Playing option in the waiting room UI. When the user clicks this option, the system dismisses the waiting room UI and delivers the Activity.RESULT_OK result code. When a player clicks the Start Playing option, the waiting room UI is not automatically dismissed for the other players in the game. To dismiss the waiting room for the other players, your game should send a reliable real-time message to the other players to indicate that the game is starting early. When your game receives the message, it should dismiss the waiting room UI. The Participant.getStatus() method returns the current status of the participant. STATUS_INVITED: The participant has been invited but has not yet acted on the invitation. Your game can also detect if a participant is connected by calling Participant.isConnectedToRoom(). Your player might be disconnected from the room due to network connectivity or server issues. To be notified when the player is disconnected from the room, use the RoomStatusUpdateCallback.onDisconnectedFromRoom() method. Once the player has signed in, your game may be notified of invitations to join a room created by another player. Your game should handle invitations for these scenarios. If the signed-in player accepts an invitation from the notification area on the Android status bar, your game should accept the invitation and go directly to the game screen (skipping the main menu). First, check if an invitation is available after the player signs in successfully. Use the GamesClient.getActivationHint() method to determine if there is an invitation to accept. If the device goes to sleep during handshake or gameplay, the player will be disconnected from the room. To prevent the device from sleeping during multiplayer handshake or gameplay, we recommend that you enable the FLAG_KEEP_SCREEN_ON flag in your activity's onCreate() method. Don't forget to clear this flag at the end of gameplay or when the game is canceled. To be notified of incoming invitations, your game use the InvitationCallback class. Incoming invitations will not generate a status bar notification. Instead, the callback receives an Invitation object via the onInvitationReceived() method, and your game can then display an in-game popup dialog or notification to inform the user. If the user accepts, your game should process the invitation and launch the game screen. The Invitation Inbox is an optional UI component that your game can display by using the Intent from InvitationsClient.getInvitationInboxIntent(). The Inbox displays all the available invitations that a player received. If the player selects a pending invitation from the Inbox, your game should accept the invitation and launch the game screen. You can add a button to launch the Invitation Inbox from the main screen of your game. When the player selects an invitation from the Inbox, your game is notified via onActivityResult(). Your game can then process the invitation. Please review Sending game data to familiarize yourself with the concepts behind data messaging using the real-time multiplayer API. Note: Your game can only send messages to connected participants. To know when peer clients are connected, your game can monitor the RoomStatusUpdateCallback.onPeersConnected() method. To send a message, your game can use either the RealTimeMultiplayerClient.sendReliableMessage() or RealTimeMultiplayerClient.sendUnreliableMessage() method, depending on the kind of message to send. Alternatively, your game can use the RealTimeMultiplayerClient.sendUnreliableMessageToOthers() method to send a broadcast message. When using sendReliableMessage(),you need to specify a RealTimeMultiplayerClient.ReliableMessageSentCallback as a parameter. If the sendReliableMessage() call is successful, the message is placed in an internal queue and a Task object is returned. The Task object provides a message token ID for the pending message. When the system actually sends the message, your game is notified through the RealTimeMultiplayerClient.ReliableMessageSentCallback. When your game receives a message, it is notified by the OnRealTimeMessageReceivedListener.onRealTimeMessageReceived() method. This method will be called whether it's a reliable or unreliable message. Be sure to register this listener when setting up your room configuration. This method will be called whether it's a reliable or unreliable message. Note: Be sure to register this listener when setting up your room configuration. Gameplay is over - If you don't leave the room, Google Play games services will continue to send notifications for that room to your room listeners. onStop() is called - If the onStop() method is called, this might indicate that your activity is being destroyed and you should leave the room. The user cancels the game in the waiting room UI - Your game should also leave the room if the response code returned in the onActivityResult() callback is GamesActivityResultCodes.RESULT_LEFT_ROOM. To leave the room, call RealTimeMultiplayerClient.leave(). After you leave the room, wait until you receive a call to the RoomUpdateCallback.onLeftRoom() method before attempting to start or join another room.